This picture was taken in Good Hope, Illinois. One of the best things about trailers is they're like money in the bank. When the cash runs dry, all you have to do is cash in on the aluminum siding! This picture was taken in Texas. Another great thing about trailers is that when you buy a new one, you can move the old one to the side and use it for a shed. I think this picture from Beardstown, Illinois speaks for itself. The proud owner of this trailer in Austin, TX has way too much time on his hands. This is another example of how trailers can truly be a work of art! It's typical to see a trailer with an "add-on", but there's nothing typical about this trailer in South Carolina. 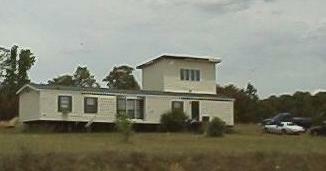 An "add-on" is usually built on the side of the trailer, but who says it can't be on the roof? 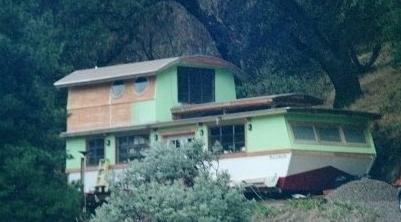 This California trailer proves that there are no rules when it comes to trailer trash! © 2002 Missouri Trailer Trash .com All Rights Reserved.